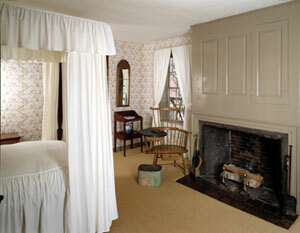 The sleeping chamber located over the sitting room, also called the "front room," was made available for guests. In such a large household, however, it was not practical to set aside one of the best chambers only for visitors. Stephen Longfellow died in this room in 1849 and may have had more frequent use of it in his later years as Zilpah's illnesses kept her confined to her chamber across the hall. Anne Longfellow Pierce also died here in 1901. Cotton dimity, a ubiquitous nineteenth-century furnishing fabric, decorates the chamber along with reproduction straw matting. The high-post bedstead, attributed to a Portland cabinet shop, is dressed with a full set of bed curtains. In 1808 the Radford brothers made a toilet table, a simple pine frame that, when covered with fabric, became a stylish dressing table. Watercolors attributed to Ellen or Elizabeth Longfellow, possibly school assignments, decorate the walls. A leather trunk used by the poet during his Europe grand tour between 1826 and 1829 was given to the Society by his daughters in 1903. "Seven very convenient and pleasant chambers" were built on the third floor in 1815. Lucia Wadsworth occupied the two southeast chambers with a panoramic view over the city, harbor, and islands of Casco Bay. Tradition gives Henry use of the large southwest chamber. The younger boys slept in the northwest chamber and the daughters in the northeast chamber, both with views to Back Cove, Deering's Woods, and Mount Washington. Among the graffiti dating between 1830 and 1857 on one window frame are the inscriptions "how dear is the home of my childhood" and "Friday eve'g July 14th 1837 - a magnificent sunset of golden clouds." The walls were decorated in 1815 with bright green calcimine paint. The paint was still visible when the third-floor rooms were photographed in 1904. At that time, the southwest room, "the poet's sleeping chamber," was furnished with early nineteenth-century Maine furniture. Of note is the bed's counterpane, the only surviving part of the curtains first made in 1808 for the best bed in the parlor chamber on the second floor.